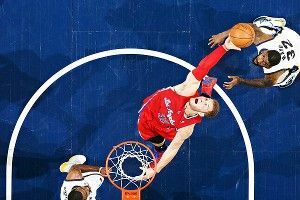 The Clippers finished with a 28-3 run to stun the Grizzlies 99-98 in Memphis and take a 1-0 lead in the first round of the NBA playoffs. It didn’t help matters that a fatigued Zach Randolph spent the final eight minutes in a laundry bin, rowing himself up and down the court with a broom he stole from the custodial closet. Rajon Rondo was ejected after bumping a referee, and the Celtics fell to Josh Smith (22 points, 18 boards) and the Hawks 83-74 in Atlanta. After the game, Rondo tried to claim that the bump was a “sign of affection,” and was then forced to sell his story by finding the ref and giving him a really long hug. Sources report that during the embrace, Rondo’s terrifying, bulging eyes never once blinked. The second round is underway in the NHL playoffs, with Philadelphia claiming a 1-0 lead on New Jersey, the Rangers starting strong against Washington, Phoenix winning the first two over Nashville, and the L.A. Kings taking Game 1 on the road in St. Louis. In related news, my longstanding dream of St. Louis moving to Utah so the whitest state in the country can have teams called the “Jazz” and the “Blues” seems less likely all the time. Chris Capuano allowed three hits and no earned runs in 6⅓ innings as the Dodgers completed a sweep of the Nationals in a battle of division leaders. The L.A. wins spoiled the debut of Nationals phenom Bryce Harper, who learned quickly that despite his optimism, nothing ever changes in D.C.
Gavin Floyd took a no-hit bid into the seventh inning in a 4-1 White Sox win over the Red Sox. Whites are also dominating reds in the actual sock world, except in the weird candy cane hobbit house where Dustin Pedroia lives. Rafael Nadal beat David Ferrer 7-6 (1), 7-5 at the Barcelona Open to become the first player in the Open Era to win two different tournaments (Barcelona, Monte Carlo) seven times. Speaking with reporters, Nadal credited his recent hot streak to the fact that he now saves energy by rigging a giant speaker near the chair umpire to play his voice shouting “Vamos!” whenever he wins a point.